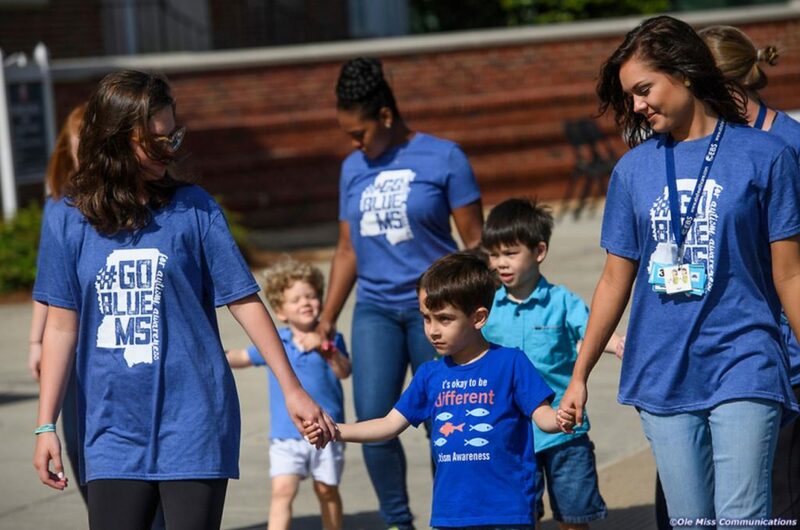 UM students participate in an annual Autism Awareness parade on campus. With the help of a $470,000 gift from Parker Lifeshare Foundation of Jackson, Mississippi, the University of Mississippi School of Education is designing a program to address the specialized needs of children across the autism spectrum and prepare the education professionals that will teach them. According to the Mississippi Autism Advisory Committee Report (2018), the dramatic growth in Autism Spectrum Disorder (ASD) constitutes a public health crisis. The Centers for Disease Control and Prevention estimates that 1 in 59 U.S. children have been diagnosed with ASD, while data from the U.S. Department of Education reveals that the number of Mississippi students with ASD receiving special education services from 2014 to 2017 has risen from 4,027 to 5,179, a 28.6 percent increase over three years. The gift enables the School of Education to hire a Board Certified Behavior Analyst-Doctoral (BCBA-D) faculty member to develop the curriculum and coursework needed for a comprehensive program in Applied Behavior Analysis. It is most commonly used in special education classes to treat behavioral challenges among special needs students, specifically those identified as ASD. The program will prepare graduate-level students to successfully complete requirements necessary to become board-certified and licensed behavior analysts. Education Dean David Rock said hiring a board-certified faculty member is the first, critical step to developing programs needed to support quality education for children diagnosed with ASD in the state. The Parker Lifeshare Foundation also supports the Magnolia Speech School, Operation Shoestring, Canopy and the UM Medical Center’s nutrition program for Shoestring — each sharing in the mission of bettering lives for Mississippians. For more information, contact Billy Crews, School of Education development officer, at 662-915-2836 or wlcrews@olemiss.edu. To help support Ole Miss, click here.